Noah Witt was hard to miss. The Clermont Northeastern High School junior was wearing a patterned purple suit coat and pants, orange shirt, green tie, and black and green suspenders. “This is a Joker suit. I just decided to wear it because my theme is comic books. I’ve had this. Actually this is a real suit. I bought it on a web site that custom makes crazy, wacky suits, and this is one of them,” Witt said. The DC Comics character was one of several “celebrities” in the CNE gymnasium March 21. Walt Disney was there, with his friend Mickey Mouse. So was Mike Tyson … the Big Red Machine. Even Kim Kardashian. All were represented as the school hosted its first SPARK Research Expo. The SPARK Expo is a “research-based display of all students currently enrolled” in high school English classes,” according to intervention specialist Beth Price. Elementary and middle school students showed their research the same night; those schools have had previous SPARK expos. “I did this project on DC and Marvel Comics. Comic books is really, it’s one of my passions. I’m wanting to maybe open my own comic book shop, and I just wanted to research on a topic that was very near and dear to me,” Witt said. That is one of the goals of the SPARK expo, Price said. “We gave them some basic instructions on what we wanted for the presentation, and they were able to use their own creativity, their own research. We kind of narrowed it down to certain things as they were researching, but this is student-led, student-driven, and they did their own posters and research,” she said. English teacher Bernadette Wayne said allowing students to choose their own subjects increased interest. “It’s just been neat the variety of ideas that a lot of them came up with. That’s what I think was so cool about giving them that freedom of choice and not even limiting to certain subject area or … some of them went more the informational route while others went more staking a claim or a stance on something, and there were several who were just truly curious, questions they had that were genuine research questions, just wanting to know more,” Wayne said. Displays, on three-sided poster board, were set up on tables across the gym floor, with tablecloths color-coded by grade. Visitors placed stickers on their favorite projects, and Peoples Choice and other award winners were announced at the end of the program. 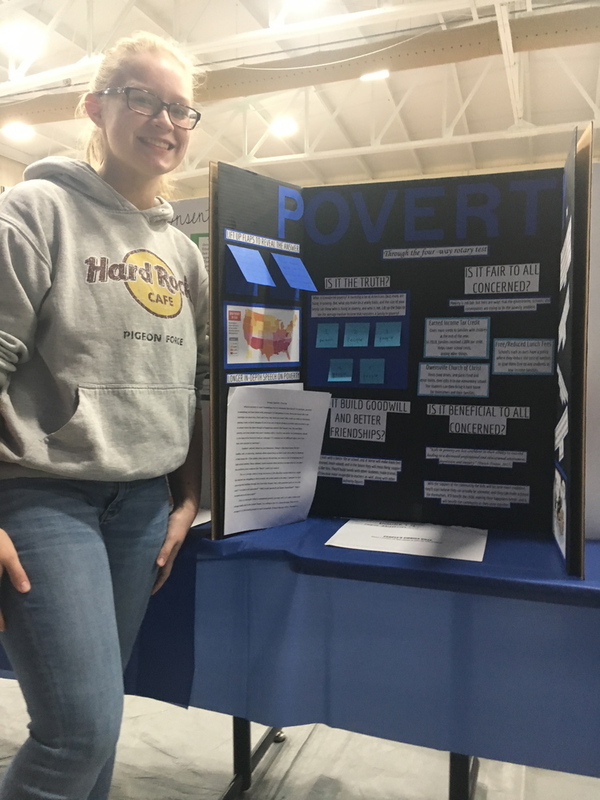 Junior Gracie Minton explored the issue of poverty – an issue that affects many in Clermont County, and learned some eye-opening facts. “That 40 percent of all kids living in the US live in poverty. I didn’t think a country as great as ours would happen like that,” she said. Minton originally researched her topic for a speech in the Rotary Four-Way test Speech contest before putting her findings on poster board. “This poster took me like a day, but the speech took me a week,” she said. Sara Twine used a vacant room at the high school as inspiration for her topic. “We have a home economics room at CNE, but it has never been used since I started my career here at the school, and so I looked into different benefits of knowing the four different topics I picked, which were sewing, cleaning, budgeting, cooking, and then I also sent out a survey to 50 seniors I knew personally from marching band and had them answer about 17 questions regarding home economics,” Twine said. The most surprising thing she learned from the survey? “The lack of knowledge about cleaning, actually. A lot of them didn’t know that they should regularly dust, or that cleaning your shower curtain could go and affect the way that your upper respiratory system works. Students also had to learn to edit and focus their research. Twine wanted to include a section about gardening, but needed room to properly display her survey results. While projects were done individually, teamwork was involved. “They might run into a roadblock and wonder, ‘OK, where do I take this next?’ or ‘What else could I ask?’ or ‘What direction could I go?’ and they kind of fit in, helped each other with it based on their own experiences or their questions based on the topic, kind of take that outside perspective based on something they hadn’t really thought of,” Wayne said. High school Principal T.J. Glassmeyer also noted that collaboration. Some students, such as Witt, hope to follow their research into a career. Others , such as Minton, simply wanted to raise awareness and begin conversations. “I hope they learn that (poverty is) a problem. I mean people know it’s a problem but they don’t know how bad it actually is,” she said.